Hope International University operates two campus locations in Orange County, California, and an extension campus in Everett, Washington. Our main campus is located in the city of Fullerton, CA, and hosts our undergraduate residential programs. 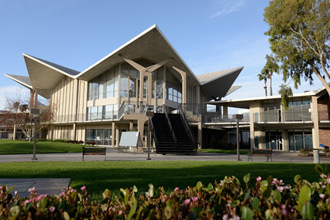 The Fullerton campus features recently renovated state-of-the-art classrooms, student dining facilities, student lounges, fitness center, bookstore, on-campus housing, full-service library, and many other amenities. Our state-of-the-art Anaheim campus is the main campus for HIU's online and graduate students. Our main campus is located in North Orange County, in the city of Fullerton, California, and hosts our undergraduate residential programs. The Puget Sound Education Center is located in Gray Wolf Hall on the campus of Everett Community College in Washington, and is an extension campus of HIU’s programs for working adults and graduate students. Overlooking the Omaha skyline, the Nebraska Christian College campus in Papillion spans 80 acres of land with more than 60,000 square feet of classrooms, dorm suites, our student center, the cafeteria and faculty and staff offices.